Today Ontario's Independent Electricity System Operator (IESO) released it's latest 18-month outlook. When their previous version was released, I wrote "At The End of the IESO 18-Month Outlook," which included quotes from the end of their past 4 versions' final paragraphs. Another large variation was in the frequency and energy volume of manual actions, such as nuclear unit maneuvers or import transaction curtailments, for surplus baseload generation conditions. In Q1 2012, there were 73 GWh of curtailments versus 32 GWh in Q1 of 2011. The rise in manual action is a result of lower minimum demands as well as a growing portfolio of baseload generation. The ability to dispatch renewable resources may help mitigate the need for these actions moving forward. It may, but it's less likely in light of the IESO's presentation prepared for a June 27th meeting of the Renewables Integration (SE-91) 'stakeholder' group, which prioritizes renewables over nuclear output (by suggesting a minimum offer price of -$10 for wind and solar, -$5 for 'flexible' nuclear). This will mean, as oversupply drops pricing into the negative, nuclear bids will be rejected first, requiring 'flexible' nuclear to curtail first. As it does now - with those curtailments having risen 128% in the first quarter of 2012 over Q1 of 2011. Those are the curtailments they acknowledge, but there is reason to be skeptical they are all the reduction in nuclear production. I updated my weekly reporting today, to reflect the June 12-19 period; the last two days having high demand growth due to a heat wave that would peak on the 20th. 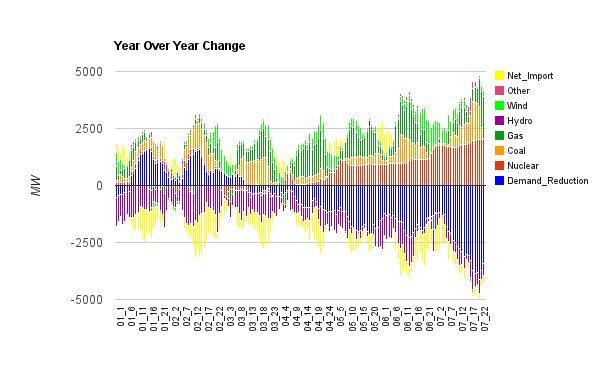 One element of my weekly report graphs the changes in supply since the same week in 2011. As demand grows (graph ends on Tuesday the 19th), it shows as a negative demand reduction, which is compensated somewhat by increased generation from coal, and natural gas, but most notably by an increase in nuclear output. Our nuclear, in Ontario, doesn't have 2000MW of flexibility at this time (although it reportedly will have, at the 8 Bruce units). Bruce unit 8 and Pickering Unit 8 both were brought back online as the warm weather approached/arrived, and Bruce 3 also returned to approximately full power for the first time since 2011. It is likely a couple of those reactors were offline primarily as the system struggles to accommodate the type of output nuclear produces (constant baseload). To end the post, and the week where Ontario's supply mix met high demand in part by returning nuclear units to service, I'll post the IESO's Surpus Baseload Generation Forecast for the days after the heat wave. Curtailments didn't end with the spring.